After the active duty portion of her commitment to the Air Force was up in March 2006, Sabrina Seronello was introduced to the practice that would help positively change her life, and the lives of others. In the latest interview for our yoga service series on The Huffington Post, Executive Director Rob Schware talks with Sabrina about the significance of her own practice, as well as her work with the Prison Yoga Project at San Quentin State Prison, where she teaches yoga to incarcerated veterans. To learn more about Sabrina’s work at San Quentin and her thoughts on the incorporation of yoga and mindfulness practices in prisons, read her full interview on The Huffington Post. Help Give Back Yoga to put yoga and mindfulness guides in the hands of 1,000 prisoners this year by purchasing Prison Yoga Project’s powerful books, A Path for Healing and Recovery and A Woman’s Practice: Healing from the Heart. For every purchase, we can fund the printing of three additional books that will be made available at no cost to men and women behind bars. 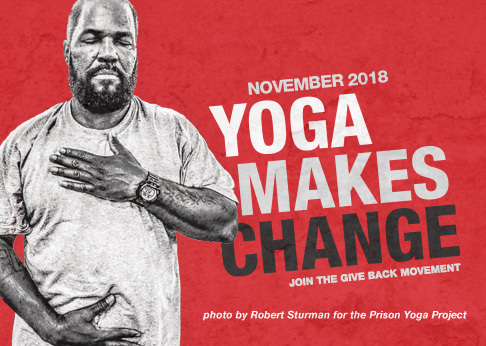 You can also make a direct donation to help fund this work – just choose “Prison Yoga Project” from the drop down menu when selecting a project to support.